The team has been working through issues on the current sprint, Cantankerous Cabbage, while beginning to plan out work for the next two weeks in Diabiolical Dewberry. Each of the three teams is progressing towards integration work for upcoming release of the re-designed Trading, Portfolio, and Account UIs, as well as longer term integration work with the V2 contracts. The design team has been putting a lot of focus on polishing and improving all mobile designs. This work will feed into the UI development pipeline over the next sprint — allowing them to bring all newly redesigned views to both mobile and desktop. At the same time, they are supporting the UI team’s efforts in polishing the current UI. The UI team has been putting the finishing touches on the desktop versions of the Portfolio and Account summary pages. They’re beginning the process of battening down the hatches in advance of a beta release in the coming weeks. This week they’ve handed the reins to the backend team so that Augur Node can feed the UI the right sets of data for the new UIs. They will be doing more polishing, bug fixing, and beginning performance improvements while awaiting the mobile designs and backend data work. The backend and middleware team have shifted gears for a short period of time to support the work necessary to release the three newly polished interfaces the design and UI teams have been working on over the previous three sprints. 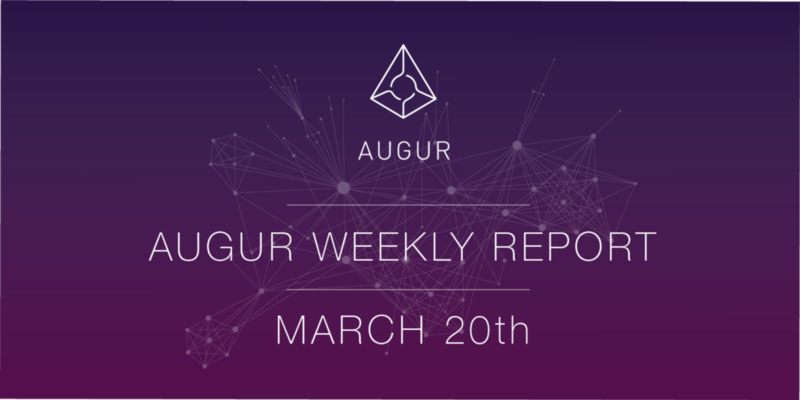 While most of the team has been concentrated on supporting the aforementioned work, progress has also been made on integrating the current Augur UI with the new Augur State middleware components as well as preparing test infrastructure.